Glam explorers from more than 70 countries around the world were invited to a fashion event that was all about not knowing was coming next. Usually when you're invited to a destination fashion or beauty event, you're either sent the itinerary in advance so you know what to expect. And just as importantly, what to pack. Or as you check into your hotel room, a personalised envelope will be left on the dressing table or bed, that tells you what activities you'll be participating in and when. 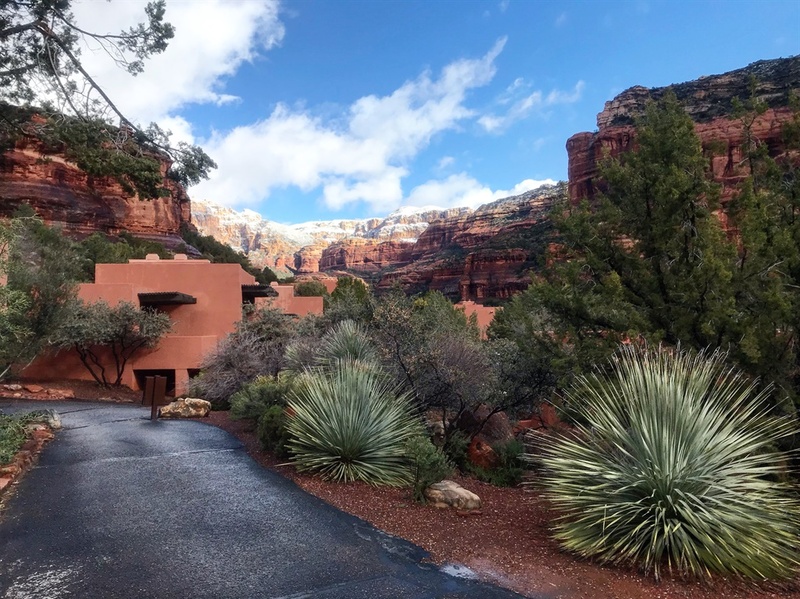 After traveling for 30+ hours, first a flight from Joburg to London, then on to Phoenix, finally a 140-minute bus ride, we arrived to meet the overbearing red rock of Sedona. We'd been given the destination with plenty of time to pin all the scenic landscapes our hearts could find on Pinterest. H&M had asked us to, as written on the back of a postcard, keep our eyes and mind open. In the box that held the note were three stones, a water bottle and a small note book with a postcard. It was handed to us as we boarded the bus from Phoenix to Sedona. Those were our clues to the days we were going to gather. And as we (media and influencers) were shuttled to the resort, we listened to a pre-recorded playlist, that included a track called Heaven by The Rolling Stones that perfectly captured the adventure. It was going to be a fully immersive event. It wasn't just about the clothes from the collection. It was about exploring and travelling with the perfect wardrobe to boot. One of the most standout pieces, a patterned, draped frock took its cues from the exquisite potash soil from the area. While other animal print pants, blouses and scarf echoed the fauna in the area and the others the spirit of being comfortable but stylish when you travel. The colour palette is a gorgeous mix of the incredible hues to be found in Sedona. After two days and nights spent in a hotel called the Enchantment resort, we had experienced a mini music festival, Olympic stunt women, synchronised swimmers, trips in a jeep driving around the sacred park in the area and our own fashion shoot where we were able to choose our favourite pieces to be styled in. A walk up to the vortex found amongst the red rock, where the juniper trees grow in spirals, was one of the highlights. It snowed for a bit as we past fellow amblers, some of whom took the opportunity to meditate or reflect on their lives or sense of wanderlust. While bringing a greater sense and context to the pieces designed for the H&M studio collection from a fashion perspective (as fashion lovers, how often do we get to look at clothes, in their real setting and see them styled so differently and surprisingly from women all around the world? ), it was also a chance to learn more about myself and others as well as connect with people and different environments along the way. It was truly magical and isn't this exactly why we travel? And there's nothing wrong with feeling confidently dressed while we do it. For a closer look at the experiences I spoke about above, follow us on Instagram to check out our stories and the video diary I took while I was away.